Still Life with Fire King. Fire-King is a brand of glassware. Created by Anchor Hocking, it is similar to Pyrex. Its formulation has changed over time; today it is made of tempered soda-lime-silicate glass. While Fire-King isn't a high-end collectible, some rarer pieces are worth a good deal of money. The popularity of Fire-King's Jade-ite, an opaque green glass produced from the late-1940s through the late-1960s, got quite a bit of fuel from Martha Stewart in the mid-1990s when a kitchen lined with this dinnerware and utilitarian kitchen glass first appeared in her magazine spreads. That, combined with a glimpse of the collection on her television programs from time to time, led to quite a Fire-King collecting frenzy. In the early ‘90s, shoppers could walk into just about any antique mall across the country and pick up an armload of Fire-King's common Jane Ray pattern in Jade-ite at a fairly reasonable price. Prices rose at the time to rival many scarce Depression glass patterns. Today, demand for this glass isn’t as high so you can expect to find it fairly reasonably piece by piece through online auctions. However, some pieces of green Restaurant Ware are truly hard to find and still command quite a high price from collectible glass enthusiasts. Anchor Hocking made a wide range of Fire-King branded wares The square Charm dinnerware pattern, which was produced in Jade-ite in limited quantities, came predominantly in opaque pale blue Azur-ite, Forest Green, and Royal Ruby. Most of these brightly colored dishes were tagged with foil stickers that have long worn away with washing and wear, but the rounded square shape is easily recognizable even when unmarked. A good book to have on hand when identifying this type of glass is Anchor Hocking's Fire-King and More by Gene Florence (now out of print but still available through used booksellers). This guide shows all the most popular patterns, pieces, and colors. The pricing data, of course, is out of date by now but you can easily do your own valuation research on most of these pieces. To delve into this type of collectible glassware more extensively, take a look at these books: Fire King: An Identification and Price Guide by Joe Keller and David Ross (Schiffer Books), and Jadite: An Identification and Price Guide also by Joe Keller and David Ross (Schiffer Books). Some of the most beautiful and collectible Fire-King items include Sapphire Blue ovenware. Anchor Hocking manufactured this pale blue glass that qualifies as Fire-King from 1942 through the '50s, although most pieces aren't marked due to the fancy pattern molded into the glass. Once you learn to recognize the light blue color, however, there’s no mistaking it. It’s also worth mentioning that dinnerware pieces produced in Sapphire Blue are referenced as “Philbe” and this is the same color as much of Anchor Hocking’s “Bubble” pattern dinnerware. Another “pattern” that must have been really popular when it was in production (given the quantities found at estate sales) is Game Birds. These pieces feature decals depicting four different types of fowl on white glass mugs, plates, tumblers, and bowls. Some of these decals were rather haphazardly applied. They are still reasonably priced and plentiful in the collecting marketplace. You'll also want to keep an eye out for the flowered Fleurette, Honeysuckle, and Primrose decals affixed to milky white glass dinnerware sets if you’re looking for an affordable alternative to Jade-ite. Most of these pieces will be marked with the Fire-King logo in raised lettering on the bottoms or backs. The Meadow Green pattern is probably the least expensive of the Fire-King collectibles. This white Fire-King glass produced from 1967-1977 sports an avocado green floral pattern in both dinnerware pieces and matching baking ware (similar to some Pyrex dinnerware). Prices on these pieces just coming into their own remain quite affordable. If you like it, collect it, and you might cash in someday as the value continues to increase. Jane Ray dinnerware prices have actually stabilized over the past 15 years or so, and have even come down some on several pieces in the set. Today you can find basic pieces like cups and saucers for less than $5 each, while dinner and salad plates generally run in the $8-15 range. Platters and soup bowls are a bit more, but still nothing in comparison to many Restaurant Ware items. By way of comparison one example of Fire-King’s Jade-ite Restaurant Ware, the coffee mugs with a “C” handle, sell for $75-100 each now. Find the same mug in white and you’ll likely pay more than $250 when shopping with a glassware dealer in the know. Add advertising slogans or logos to one of these heavy glass mugs and the price can jump up to $300-$500 or more. Matching flat-rimmed soup bowls usually sell in the range of $75-100 each. And a ball pitcher can run in excess of $600 if you’re lucky enough to find one. These prices make the more plentiful “D” handle mugs, chili bowls, and standard cup and saucer sets look like bargains when you can pick them up for $10-15 apiece. Prices on the Sapphire Blue pieces have risen high enough that most owners of this glass feel more comfortable putting it on a shelf to admire than using it in the kitchen. A set of mixing bowls or a two-part covered round roasting pan might bring $50-75, while the majority of these pretty pieces sell in the $10-30 range. Custard cups are the most commonly found items, bringing around $5 each in an antique shop. But mugs and dinnerware pieces, known as the Philbe pattern, generally sell for much more with a single mug bringing $50 to $200 or more depending on whether the glass is thick or thin. When looking for Fire-King bargains, your best bet would be to concentrate on the dinnerware sets made of white glass with decals also mentioned above. Even though book prices for Game Birds and other white with decal sets might reflect higher values, they just haven't garnered enough of a following yet to compete with Jade-ite and Sapphire Blue. You can put together a nice set paying $5-10 per piece, if not less. 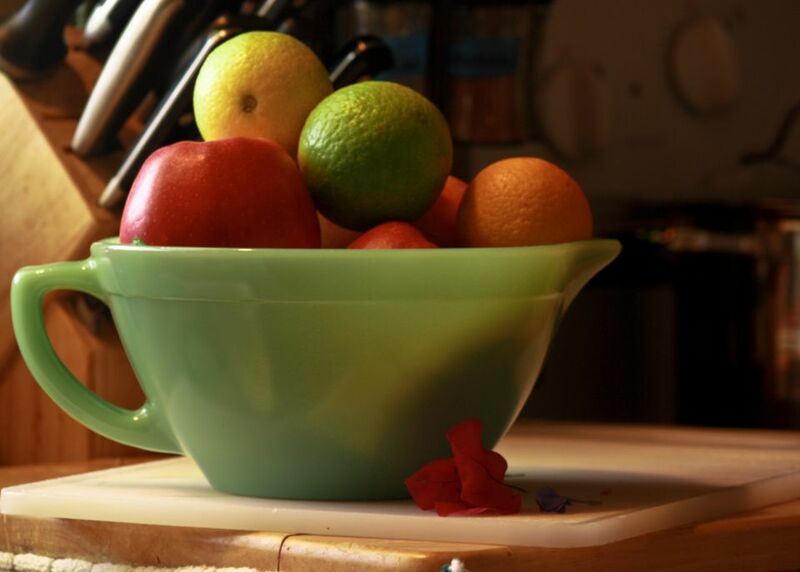 Some Jade-ite mixing bowls, shakers, and other kitchenware can also be found reasonably priced today at around $25 each, and often for much less.